Not what I thought I’d write! I had an idea in my head, of what I would be writing this morning. In fact, it has been drifting around in my cotton wool brain for the past few days. I considered drafting it so I wouldn’t have so much to do this morning, then I remembered that this is all I have to do this morning…and even this isn’t compulsory 😉 . Then, before I started to type, I read back through last week’s post. I generally do that most weeks, to remind me where I’d got to when last I wrote. This week I did it out of habit and I’m glad I did. I thought this post would go along the lines of ‘woe is me, I can’t do stuff, I’m not well, I’m not recovering very fast at all, but here is some knitting’. Instead I find myself surprised at how much better I am than a week ago. I’m moving around comfortably, not in much pain at all, doing most of what I want for myself (as long as I keep it reasonable) and improving every day. I still can’t cook meals or do household stuff, and I can’t walk very far. But really I am much better. Anyway, as I predicted last week, this has been another week of television and knitting. I have borrowed the box sets of all the series of House, from a colleague, so I’ve been watching those. It’s a really good programme and I’m enjoying it. 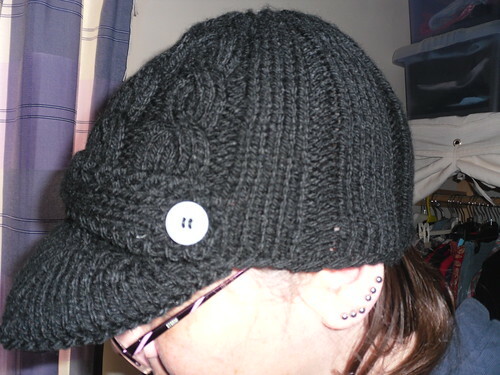 It ended up being more like a beanie with a brim, but I like it. I was struggling a bit with the ball of yarn rolling around and not feeding smoothly, so I stole the kitchen towel holder from the kitchen. The ball stays where I want it, the yarn isn’t getting grubby from contact with stuff and it feeds much more evenly. I’m happy with it, but A is not convinced – every time he tries to pull off a piece of kitchen towel, the roll falls off the shelf! 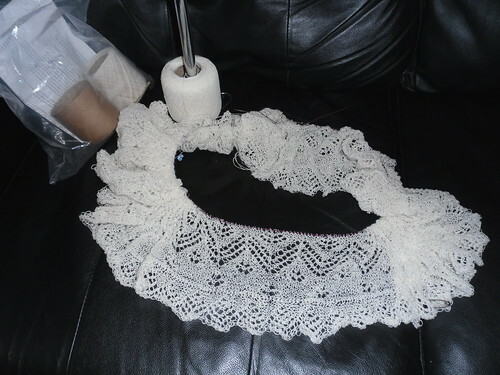 That’s the saroyan shawl. The increase repeats are done (I did 10), and so far I have 10 straight repeats. I think a few more straight repeats, then I’ll start decreasing. 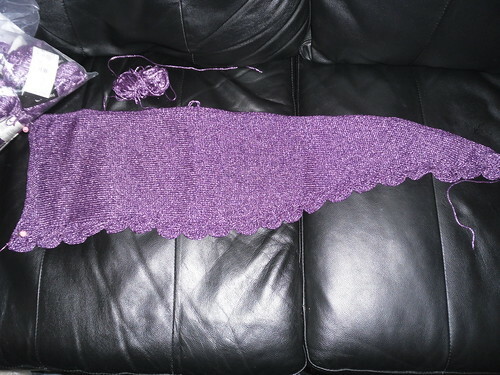 This is the Pimpelliese shawl, using Violet Green Stellar yarn. 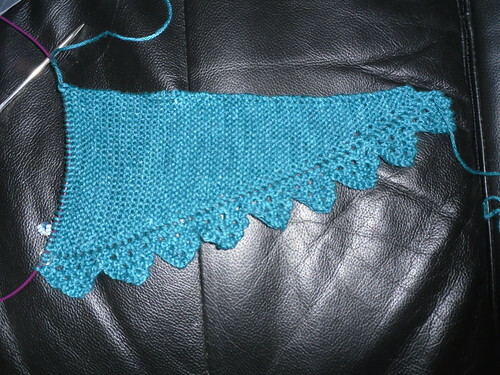 I’m really enjoying this one – the pattern is simple yet effective, and easy to remember. The yarn is so soft and lovely to knit with. Finally, as always, there are socks! 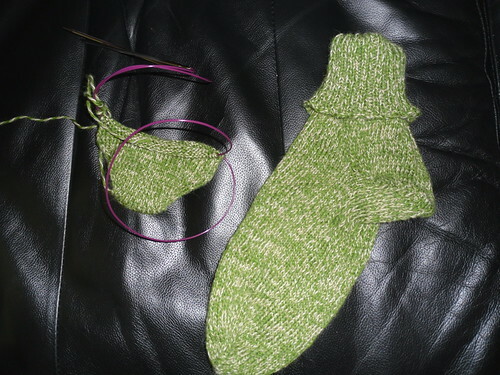 That’s one finished bedsock, and one toe. They don’t look much, but they aren’t meant to be fancy or exciting. They are soft and baggy and cosy. Just what I wanted. So, this coming week…more of the same I expect. I’d really like to get to Knitting in the Library, so I’m checking out my options for that. More House, more knitting, more sleeping! This entry was posted on October 30, 2010 at 10:43 am and is filed under Health, knitting. You can follow any responses to this entry through the RSS 2.0 feed. You can leave a response, or trackback from your own site. I’m glad that you can see an improvement, and hope that you’ll see a good improvement when you look back at the end of next week! And the knitting progress is awesome! House isn’t something I’ve got into yet, but it sounds like it should be.